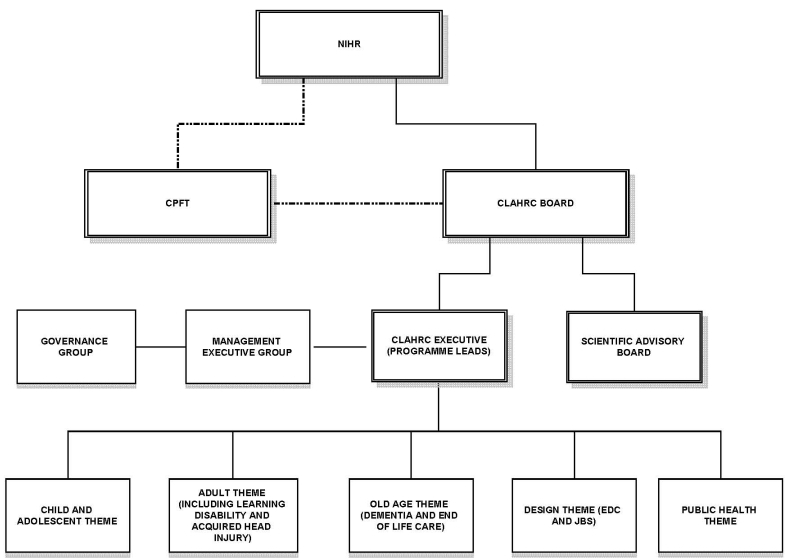 The CLAHRC Board represents the highest level of governance and is the main accountable body of the NIHR CLAHRC for Cambridgeshire and Peterborough (CLAHRC CP). It is responsible for the implementation and overall direction of CLAHRC CP and operates as the main steering and scrutiny group for the CLAHRC. The CLAHRC Board is accountable to the Cambridgeshire and Peterborough NHS Foundation Trust (CPFT) and the National Institute for Health Research (NIHR). The Scientific Advisory Board is an independent panel which overseas the research methodologies used in the themes and provides advice to the Director on the programmes, and in particular on their academic quality. The panel also oversees the adoption of future research or implementation themes into CLAHRC CP to ensure continued high academic standards. The panel consists of academics with a world-class reputation in health services research and who are external to CLAHRC CP. The Scientific Advisory Board meets annually and reports to the CLAHRC Board through its Chair, who also sits on the CLAHRC Board. The CLAHRC Board has delegated operational responsibility for CLAHRC (CP) to the CLAHRC Executive. The CLAHRC Executive is directly accountable to the CLAHRC Board and reports through the Director. The CLAHRC Executive ensures the CLAHRC delivers its objectives and proactively monitors the progress of the themes and implementation of research findings into practice. Members of the CLAHRC Executive include the 5 theme leads, key senior managers from NHS and social care partners and the University of Cambridge.